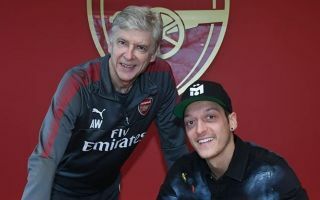 Reliable Arsenal blogger Arseblog claims former Gunners manager Arsene Wenger had some reservations about the new contract for Mesut Ozil last year. The German playmaker ended up committing his future at the Emirates Stadium after a protracted contract saga and links with other big clubs. However, things have not exactly worked out well for Ozil since then, with Wenger leaving Arsenal in the summer and being replaced by Unai Emery. Far less ready to indulge star players, the Spanish tactician has quite quickly frozen Ozil out of his first-team plans, leaving him on the bench or out of his matchday squad altogether at various points this season. The 30-year-old is now being linked with an exit once again as the Daily Mail claim Emery is ready to cash in on the player and get his £350,000 a week wages off the club’s wage bill. However, it seems Wenger also had his doubts about keeping Ozil at the club on so much money, despite wanting the former Real Madrid man to stay. Of course he was, but it was clear in Jan that he was being pushed sideways. Gazidis and Sven alerting German press so they got pictured in Dortmund, for example. Was told by someone v reliable that Wenger was happy for Ozil to stay but thought the wage was too big.